Ultra-luxury cruise leader, Silversea, unveils a collection of 34 shore excursions, carefully designed for its new 16-voyage Cuba collection for 2019 and 2020. Taking guests closer to the authentic natural beauty and amazing cultural and historical treasures of the Caribbean island nation, the onshore experiences in Havana, Santiago de Cuba, and Cienfuegos will provide immersion into the local way of life. Enhancing the cruise experience, the shore excursions will showcase the most important attractions in and around each city with Silversea's trademark destination expertise. "We are pleased to launch a diverse array of tailor-made experiences that will enable our guests to travel deeper in order to discover and appreciate a land seemingly frozen in time, yet filled with awe-inspiring scenery, extraordinary people, and a vibrant culture," says Adria Bono, Silversea's Director of Shore Excursions. 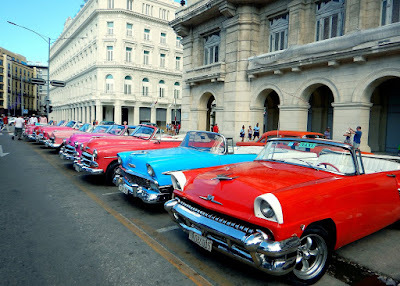 Whether riding in a colourful Pontiac, Chevy, or Cadillac, guests on this unique excursion will experience Havana in authentic 1950s style from the comfort of a vintage American car. Under the knowledgeable guidance of a private driver and guide, guests will journey through the colourful city and along the spectacular waterfront. The excursion will also feature a cocktail at the historic Hotel Nacional de Cuba and a panoramic drive, which will showcase the Plaza de la Revolución, El Malecón, landmarks, churches, city parks, Miramar, the Nelson Domínguez Gallery, and more iconic attractions. Ernest Hemingway's well-documented love of Cuba is explored on this panoramic sightseeing excursion to his favourite local haunts. During this enriching adventure, guests visit Hemingway's former home, Finca Vigía, in the town of San Francisco de Paula; the Hemingway Monument in Cojimar, the fishing village that inspired the novel "The Old Man and the Sea"; and several of Hemingway's hangouts, located in the World Heritage-listed Old Havana. At a venerable cabaret-style venue, guests will feel the authentic rhythm of Havana with 'Legendarios del Guajirito,' an exclusive live performance by the renowned Buena Vista Social Club—a Grammy-winning ensemble of musicians. Guests will be transported back to 1950s Havana in a stirring nightclub ambiance, where they will enjoy cocktails and mingle with band members. The colonial and wartime history of Cuba is unlocked during this scenic and informative journey to the famous sites of the Cuban Revolution and the Spanish-American War. Among the tour's highlights are visits to the historic district, with its colourful colonial buildings and bustling Céspedes Park; the Moncada Barracks; Santa Ifigenia Cemetery; Plaza de la Revolución; and San Juan Hill, where Teddy Roosevelt's Rough Riders rode to victory during the Spanish-American War in 1898. Guests will gain an appreciation of Cuba's religious heritage, music, cuisine and history on an adventure to the old mining centre of El Cobre. Set in the Sierra Maestra foothills, the town is home to the Basílica de Nuestra Señora, one of Cuba's most important religious sites. The excursion also features a musical performance by the local steel band; a drive through Santiago, which will spotlight such historic sites as the Plaza de la Revolución and San Juan Hill; plus a visit to a local restaurant for an authentic Cuban lunch. This panoramic journey into central Cuba provides an immersive experience of World Heritage-listed Trinidad. Guests will travel back in time on a stroll through the Old Town, admiring cobblestone streets, a neo-baroque main square, grand colonial buildings, and beautiful old churches. A visit to the Potter's House reveals artisans at work in a traditional open-air workshop. Afterwards, stops will be made at a local artist's gallery, then for refreshments and lunch. Guests will also visit the Municipal Museum of Trinidad to explore relics of the city's past, before visiting the panoramic Valley of the Sugar Mills observation point. The stunning natural beauty surrounding Cienfuegos is the focus of this memorable hiking and sightseeing adventure to El Nicho. A guided hiking trek along the forested trails of El Nicho, one of Cuba's most pristine locales, showcases cascading waterfalls, virgin forests and towering mountains. Guests will visit the village of Crucecitas and San Juan Peak for breathtaking panoramic vistas overlooking central and western Cuba from approximately 3,800 feet (1,158 meters) above sea level. A stop for lunch, a visit to the Jobero Verde Community Project, and free time to explore the historical centre of Cienfuegos is also included. A detailed program and prices will be available on guest's MySilversea portal 120 days prior to sailing dates. · 5906 – Silversea's recently lengthened Silver Spirit will depart San Juan on 22 February 2019, for Fort Lauderdale (Florida). Guests will visit Santiago de Cuba, George Town (Grand Cayman), Cienfuegos, La Habana, and Bimini in the Bahamas, developing a deep appreciation for local culture through Silversea's bespoke shore excursions. Fares begin from AUD$5,700 based on double occupancy in a Vista Suite. Guests booking by 20 December 2018 will also receive a one suite category upgrade, US$1,000 on-board credit per suite, and an extra 5% per person off the cruise fare. · 2912 – This 10-day voyage aboard Silver Wind will give guests the chance to travel deeper into Cuba's fascinating culture. Departing San Juan on 31 March 2019, the ship will spend an overnight in Santiago de Cuba, before calling at George Town (Grand Cayman), Cienfuegos, La Habana, and Bimini in the Bahamas, prior to arriving in Fort Lauderdale (Florida) on April 10. Fares begin from AUD$6,200 per person, based on double occupancy in a Vista Suite. · 2913 – Departing Fort Lauderdale (Florida) on 10 April 2019, Silver Wind will call at Santiago de Cuba, La Habana, Nassau (Paradise Island), and Bimini in the Bahamas, before returning to Fort Lauderdale on April 19. This 9-day voyage will spotlight the region's highlights for guests, enabling them to delve deeper into the destination. Fares begin from AUD$5,700 per person, based on double occupancy in a Vista Suite. Guests booking by 20 December 2018 will also receive a one suite category upgrade, US$1,000 on-board credit per suite, and an extra 5% per person off the cruise fare. Aboard Silversea's ships, guests enjoy ocean-view suites, sumptuous cuisine, and the personalised service of a butler. Enriching the experience are such all-inclusive amenities as complimentary premium wines and spirits, specialty coffees, bottled water, juices and soft drinks served throughout the ship; an in-suite bar, stocked with guests' preferences; an in-suite 24-hour dining service; and unlimited complimentary Wi-Fi.